Standing on the foot of magnificent Mehrangarh Fort, Krishna Prakash Heritage Haveli (almost as old as Mehrangarh Fort) is an authentic heritage haveli, lovingly resorted, to serve as a comfortable oasis for present day travelers in their quest for the charms of Rajasthan. This magnificent sandstone building with its imposing but delicately carved exterior and simple yet comfortable interiors is a genuine heritage edifice in a sylvan setting, stands as an oasis of hospitality, pageantry and Marwari charm. 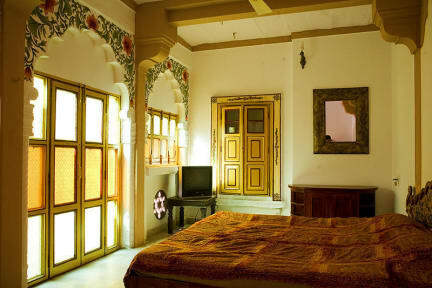 Now converted into a Heritage Hotel, Krishna Prakash Heritage Haveli opens doorway to a unique experience of the Marwar region by bringing back to life the grandeur of the old days. Overlooking the seemingly invincible Mehrangarh Fort on one side and the gigantic Umaid Bhawan Palace on the other, Krishna Prakash Heritage Haveli holds the lingering echoes of a bygone era, like no other place. At, KP we ascertain to offer uniqueness in each aspect of our services. The warmth and grandeur of the heritage city can be well observed in our hospitality and customer care. For us, comfort and satisfaction of our customers is of prime importance. We believe in offering ultimate comfort to our customers. Our belief extends to sufficing to their needs and requirements, living up to their expectations and making their experience memorable. Further, we value the time of our customers, thereby we ensure that there are no delays in our services. The hotel comprises of 26 standard & deluxe rooms with attached bathrooms, and 2 luxurious suits. Each guest room has its own style and appeal, suitable furniture and furnishings according the specific decor; and a delightful view. Apart from our host of services, we ascertain to make overall experience of our customers unforgettable. We organize everyday folkdance and music by gypsies with dinner. Every evening it's cultural extravaganza. KP offers unique and exorbitant rooftop restaurant dinning, with variety of menus ranging from a delectable palette of traditional Marwari cuisine to restaurants which offer a-la-carte options. 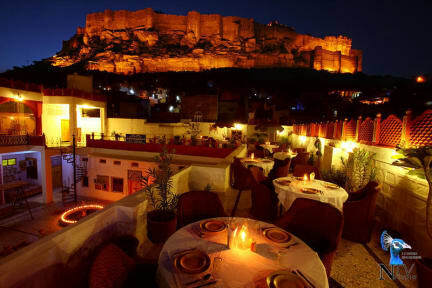 Open-to-sky moonlit terraces under a canopy of stars with Mehrangarh Fort as its backdrop lend to the Haveli an ethereal elegance and bring the rooftop alive. Tribal dances, barbeque meals and a fireworks display are organized to make the occasion a memorable one. The reflection of the illuminated Mehrangarh Fort and Umaid Bhawan Palace and the twinkling lights of the city further beatify the dining experience of our tourists. A high standard of cuisine from a comprehensive menu is KPs specialty. The spacious big rooftop west side of the haveli is specifically decorated for theme dinners. Various theme dinners are organized at this rooftop to bring tourists closer to Indian tradition & enjoy the Indian culture. oLatest standards, blending happily with old-world charm.